A compelling documentary which pushes the boundaries of captivity through astonishing filmmaking. Much like previous documentaries such as ‘The Impostor’, ‘Blackfish’ is constructed very much like a psychological thriller which had me at the edge of my seat whilst also mesmerised at how stunning the Orca truly is. Director Gabriela Cowperthwaite captures Orcas in their purest form in the ocean, connoting how they aren’t just average mammals but very intelligent and beautiful who shouldn’t be captured for the sake of entertainment at places such as SeaWorld. Experts are shown through the talking head interview style presenting that although the Orca is a magnificent creature in the wild, whilst in captivity the Orca is sadly a threat to the trainers of SeaWorld. Throughout the film, I was very disturbed by what was shown to me such as the number of dangerous incidents involving Orcas being emphasised. Archive footage is shown over the years at SeaWorld showing what an Orca is capable of doing such as dragging a trainer to the bottom of the tank in an attempt to drown them. I was once again shocked at how this can happen even though SeaWorld is presented as a company which doesn’t seem bothered at the problem which frustrated me. Former trainers at SeaWorld try and deduce why this would happen and it’s obvious that the Orcas are clearly frustrated with the very enclosing spaces they now have to live in. It seems that Cowperthwaite makes it feel very much like a prison with no hope of escape. SeaWorld isn’t exactly given a positive presentation in this film. I was appalled at the archive footage which presents some of the disrespectful things they state such as blaming trainers for their own deaths/injuries instead of the Orcas who are actually responsible. 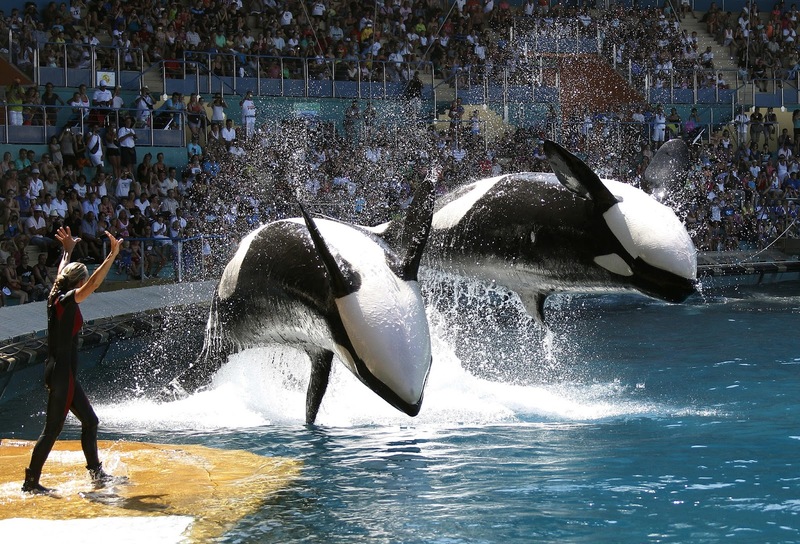 There were also ridiculous inaccuracies that were said by some of the workers who state to the general public that orcas can live up to 35 years when actually, the experts show they can live up to 100 years old. The film is very well directed and edited by Cowperthwaite and Eli Despres respectively that it really puts you in the mindset of an Orca, asking is it worth exploiting their amazing character for mere entertainment? The answer is clearly no as this results in crushing their positives spirits into something deadly and very upsetting. The music by Jeff Beal I also felt fitted in well, with frequent harmonies presenting both the good and bad sides of the Orca and how people felt witnessing this. It isn’t just the trainers who are presented to be at risk of injury or death from an Orca but even the Orcas themselves. There are very unsettling scenes presenting some Orcas attacking others brutally out of, once again, frustration and suffering is implied from both Orcas involved which made me feel angered at SeaWorld yet again. The trainers interviewed for the film I felt had interesting stories to tell, they do indeed feel angered by SeaWorld but have fond memories with killer whales such as Tilikum, a 12,000 pound Orca who was involved in the deaths of two trainers. I was moved by what they had to say whilst the archive footage presents them at work bonding with the Orcas that it felt like Cowperthwaite was implying a deep kindred spirit. I was shocked but very moved by ‘Blackfish’. It shocks me that this truth presented something that actually happened and impacted a lot of people. For me, this is a very important film about our morality and if capturing animals is an acceptable thing to do in this day and age. ‘Blackfish’ clearly states no and has profound evidence from footage, trainers and Orca experts that it really tries to persuade that we have to help killer whales be set free. I certainly agree, how can’t you after being moved by such amazing creatures? There’s so much charm to them and they deserve compassion, love and most importantly, the freedom to roam the ocean without suffering and without loss.